Soon after the world was awash with vertical scrollers (Vulgus, 1942, Terra Cresta) so it’s something of a technical achievement of just how smooth this plays. Enemies appear in a random pattern from the top of the screen, push forward and your ship speeds towards them, pull back at the ship reverses away. With this you can retreat safely into the distance and momentarily catch your breath. Clear all the enemies away and you move onto the next wave. However, over time and waves, the enemies begin to transform into little shits complete with more erratic and evasive behaviours, with some firing not only the standard bullets but bullets which then track you and fire bullets themselves. 16400 – My first attempt catches me off guard somewhat. It’s quicker than I’d expected and no less forgiving. The enemies on the first wave are fairly docile and fire off the odd cursory bullet to suggest they’re trying but every now and again they’ll fire off a shot with the speed and precision of a SAS sniper and unless you’re quick on the warp button (which clears all bullets and hides you away for for a few seconds) you’ve had it. 91140 – Ah…. About 20 seconds in an asteroid makes an appearance. Shoot it, all the enemies cease shooting and a small astronaut is released. Collect him and for the next 10 seconds or so enemies dont’s shoot and they give you progressively more and more points. 276120 – With three days left until the podcast cut off I feel I’m hitting a wall somewhat. 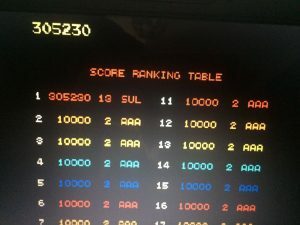 Getting closer to Rodrigo Lopes score but with others on the challenge (#10pScore over on Twitter) hitting close to 3 million, (Yes I’m looking at you CharlieFar!) I’ve a looong way to go. Ether the Twin Galaxies settings were set harder than these or no one has bothered submitting any but Charlie Far has blown it will out the water if so. For now I think it’s now my personal target to reach over 300k before the challenge comes to an end.